This is the second installment of Mizkan, Bringing Flavor to Life campaign on Rasa Malaysia. (Please check out the Salmon Teriyaki recipe and the Mizkan landing page.) The featured recipe today is Japanese beef rolls and enoki mushroom with Ponzu sauce. One of the defining characteristics of Japanese cuisine is its emphasis on visual presentation, and this recipe delivers just that. This is often my go-to recipe whenever I have a party, or whenever I wish to impress my guests. These beef rolls are best served as an appetizer as your guests take in sips of wine and mingle around. This beef roll recipe is inspired by the popular beef tataki, or sliced seared beef prepared using the tataki cooking technique. Traditionally, tataki-style beef are prepared using a Japanese mesh grill tray over charcoal fire, with only the surface of the beef cooked. Then, the meat is plunged into a bowl of cold water to stop the beef from cooking. For my beef roll recipe, I adapted and simplified the cooking method so everyone can attempt it easily at home. I prefer my beef cooked so I used a non-stick pan and seared the beef until slightly charred on the surface. Two of the most important components of this recipe is the marinade and the serving sauce. For the marinade, I used Mizkan (Bonito Flavored) Soup Base and Mizkan HONTERI Mirin Seasoning, and for the serving, I drizzled the beef rolls with Mizkan AJIPON® Ponzu Citrus Seasoned Soy Sauce. I especially love the Ponzu sauce as it adds a citrusy flavor to the beef rolls and complements the taste beautifully. Ponzu has become more common due to the increased popularity of Japanese cuisine. Nowadays, you can easily find Ponzu at regular grocery stores here in the United States. There are many brands of Ponzu available, but Mizkan AJIPON® Ponzu is the best, in all honesty. I am saying this not because I am working with Mizkan, but because I have another bottle of Ponzu by another Japanese manufacturer in my pantry. After a side-by-side taste test, Mizkan AJIPON® Ponzu is a clear winner. Do try out this Japanese beef rolls recipe. It’s really quite a treat. Easy Japanese beef rolls recipe with ponzu sauce. Made with Mizkan HONTERI Mirin and AJIPON Ponzu. Slice the beef (across the grain) thinly to 3-inch by 5-inch pieces. Marinate the beef slices with Mizkan (Bonito Flavored) Soup Base, Mizkan HONTERI Mirin Seasoning and sake for an hour. Heat up the butter in a non-stick pan over medium heat. Add the enoki mushrooms to the pan and cook for about 1 minute or until they are just done. (Do not overcook the enoki mushrooms, they should remain somewhat crunchy. Heat up the pan over medium heat. Grease the pan with some oil. Pan-sear the beef slices until both surfaces are slightly charred. Remove the beef from the heat. 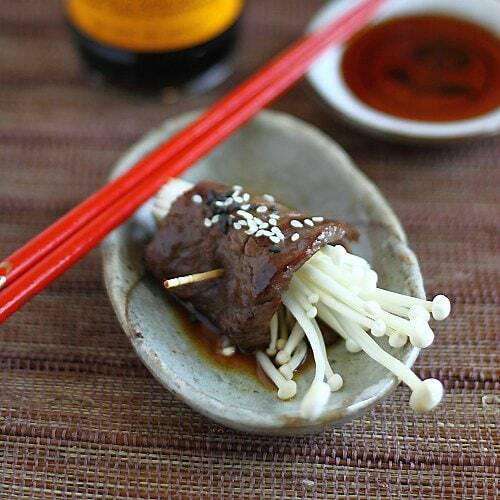 In a serving dish, roll the beef with some enoki mushrooms and secure it with a toothpick. Drizzle some Mizkan AJIPON® Ponzu Citrus Seasoned Soy Sauce over the beef roll and topped with some sesame seeds. Serve immediately. I think I’ve had this at a high-end Japanese restaurant somewhere, it was delicious. Glad that you shared the recipe. Where can I get Mizkan ponzu? You can get Mizkan products at Japanese grocery stores or Asian stores such as H Mart, Mitsuwa, etc. Some American stores also has it. I’ve always wondered what I can do with ponzu sauce. Thanks for this recipe, now I know how to use it. That’s great, hope you get to try this recipe. Love the pictures and your recipe. Would be great if you can share more ponzu recipes. I only use it as a dipping sauce for dumplings/gyoza. You can use Ponzu for many recipes. Just think of it as a soy sauce with citrus flavor, and it will open up a lot of new ideas. Oh YUm! Nice and simple. Looks so delicious. How do you make Ponzu sauce? Ponzu sauce is made with soy sauce and citrus such as yuzu. How to make Ponzu sauce? Hi, I’ve a question on your cornflakes cookies. How long do I need to cream butter & sugar on my Kenwood electric mixer and at what speed? I’m a new baker & appreciate your reply. TQ. This looks amazing! What makes one ponzu sauce better than the other? I love Mizkan ponzu because it’s actually very light and the flavor is clean. Just the right balance of citrusy flavor mixed with soy sauce, it’s not overpowering. I believe it’s the preferred brand at Japanese restaurants because it tastes exactly the same as the ones used at restaurants. I have another brand and that one wasn’t as good as the taste was too sharp for my taste. this is such a simple recipe but it looks delicious and elegant. good party food! Yes, you are absolutely right. It’s a great party food!! This looks really good. I have never tried this! These are beautiful. Bet they’re delicious, too. A few years back, Nakano was making a push into my local grocer with mirin, rice vinegar and such. They reorganized and renamed themselves as Mizkan to bring themselves into alignment as a single global brand. They were also known as Mitsukan for a while too in some parts of the world. We love tis dish. Now, I can learn to make this too…thks for sharing Bee Yinn. I have eaten a similar dish with asparagus instead of enoki called asparagyu. it is super yummy I could bet that this is just as good.